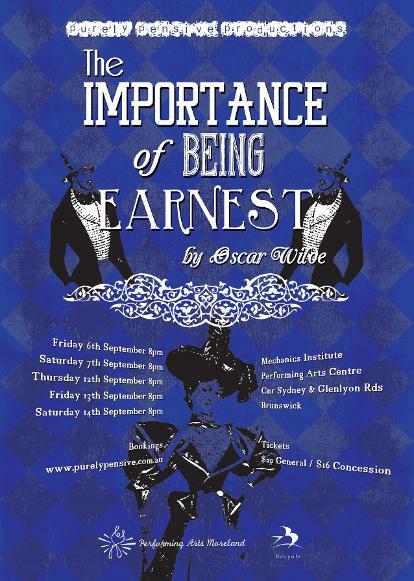 The Importance of Being Earnest was presented by Purely Pensive Productions on September 6,7,12,13 & 14 at the Mechanics Institute Performing Arts Centre, Brunswick. Two young gentlemen living in 1890s England tell a few white lies in order to bring some excitement to their privileged lives. Jack invents a brother, Ernest, who he uses as an excuse to escape from his life in the country to visit his flame Gwendolyn. Algy decides to take on the identity of the mysterious Ernest when visiting Cecily at the country manor. However when both men show up at the country manor at the same time with different versions of Ernest, things quickly turn and hilarity ensues.